The Church Society of the Diocese of Quebec is the oldest missionary society in the Canadian church. The formation of church societies was a first step toward self-government in the Anglican Church in British North America. They provided the laity with the first recognized role in assisting the clergy in raising money for missions, for religious education, and for managing the church’s temporal affairs. 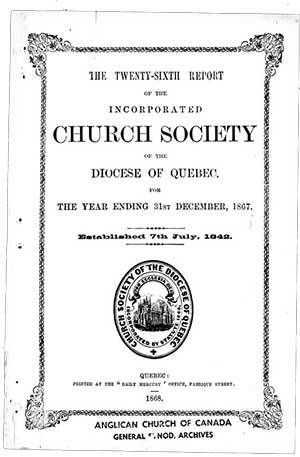 The decision to form a Church Society for the Diocese of Quebec was made in 1884. The purpose of the Church Society was, and continues to be, “missionary labour”: augmenting the stipends of poor clergy, making provision for infirm clergy and their widows, supporting Christian dducation, aiding candidates for holy orders, distributing prayer books and Bibles, and assisting in the erection and maintenance of church buildings, and in the care of cemeteries and church properties. Largely through the proceeds of its investments, the Church Society provides 90 per cent of the mission funds and half all the Christian education funds in the Diocese of Quebec. It provides about a third of the funds to support the ministry of the bishop and the administration of the diocese, and is entrusted with the stewardship of several parochial and cemetery endowments. If you are interested in becoming a member of the Church Society, making a contribution, or additional information, contact Secretary Marie-Sol Gaudreau. the purposes of receiving audited financial statements, electing members and other business on Friday, April 26, 2019, beginning at 7:00 p.m., at the Cathedral Holy Trinity (31 rue des Jardins, Québec, QC). Members of the Church Society can view documents in advance of the meeting by clicking on the links below and entering the password included in your letter of invitation.